Every horse, no matter in what discipline it is ridden, will benefit from working with cavalletti. For Olympic champion Ingrid Klimke, riding over cavalletti is key to success. Cavalletti training improves the horse’s basic gaits, develops rhythm, suppleness and cadence and increases fitness and agility. 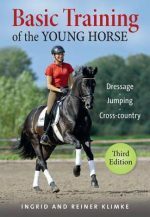 This handbook describes how to work with cavalletti on the lunge, provides valuable new schooling ideas and inspiration for dressage work, as well as numerous layouts for gymnastic jumping. Over the years Cavalletti has become a standard reference book. This revised edition for 2018 has new photographs and has been updated and extended.